The objective evaluation of the image quality provided by a given photographic device can be achieved by means of several methods. These kinds of measurements may consist in individual tests of the various device components as lens resolving power (RP), sensor effective resolving power, signal to noise ratio (SNR) and dynamic range (DR) or system measures encompassing all the individual components behavior. Being the digital image file a conveyor of information able to be analyzed in the convenient way, the most used methods at application level are done over the whole system performance using the data carried by the system output signal: the image. The basic procedure is to take information for calculations from the image of an adequate test target captured under given and controlled conditions. Provided the human visual system capabilities, the perceived quality on imprinted or screen observed images is dependable on two basic components: resolution and contrast (11.-WILLIAMS). This is the reason whereby lens and film respective resolving power, lens image contrast and film acutance (11.-WILLIAMS) have been used as standards in the past. 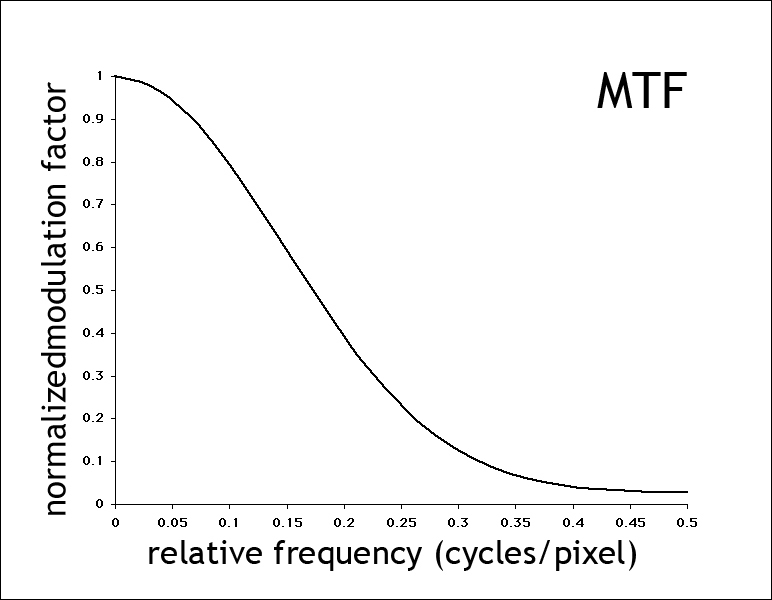 Moreover, the measure of the image contrast modulation as a function of the input signal frequency, results in the modulation transfer function (MTF) of the lens, film or system respectively. The Figure 1 shows an MTF curve obtained from a digital still camera. Figure 1 – MTF curve of an actual digital still camera showing the normalized modulation factor against frequency input, here in relative units (cycles/pixel). In an electronic photographic device, the MTF can be measured from the single lens, from the electronic sensor or from the combined system including the internal processing and the capabilities of adjustable settings and interchangeable lens. Measured in this way, the system MTF is an effective indicative of the device performance and an excellent method to compare the quality proportioned by two or more devices for given conditions of use. The measure of the system MTF in electronic photographic instruments can be achieved by application of different procedures. All of them must ensure a test target containing frequency components beyond the system resolving power; this procedure supplies the ability to detect the response extinction or the false responses due to the presence of signal aliasing. In second place, the test target must be able to be positioned at different working distances provided the optical response is influenced by the object distance. Finally, the test must be dimensioned in size to be suitably positioned on the object field region corresponding with the image field area to be analysed. Among the several possibilities, the most used test targets are the bars and spaces test as the USAF1951 Test Target, the Sinusoidal Test Target, the Pulse Response Test Target, the Edge Response Test Target and the Random Pattern method. The USAF1951 Test Target is a test initially designed for lens resolving power measurements but subsequently used for film resolving power determinations and, with adequate metering procedures, for lens, film or photographic systems MTF measurement. The USAF1951 3-Bar Resolving Power Test Chart (Figure 2) responds to the standard MIL-STD-150A, Section 5.1.1.7 (4.-GLYN). Observing the distribution of the patterns as shown in the Figure 2.2, the different groups are helicoidally arranged rising its spatial frequency from outer sides to the central region of the test. This distribution applies for the expected better resolving power near the lens axis compared with the amount achieved on the periphery of the image field. Figure 2 – Positive version of the USAF1951-1X test target showing the patterns helicoidally arranged with lower spatial frequencies at the exterior and growing its value to the center. The Sinusoidal Test Target (8.-LAMBERTS) consists in a series of sinusoidal variations of photographic film density. Several sizes of test can be used depending on the working distance and the input frequency necessary to exceed the cutting off frequency of the device under testing. The classic distribution of this kind of test and a sample of the density profile plot are shown at Figure 3. The use of both the USAF1951 and the Sinusoidal Test Target for the measure of the system MTF is generally constrained by several drawbacks derived from its physical size and the difficult to be appropriately placed in a concrete object and, consequently, image field region. In the majority of cases and depending on the particular image magnification, the different patterns belonging to each spatial frequency are positioned on distinct areas of the image field, preventing the possibility to do comparable measures from a unique picture. 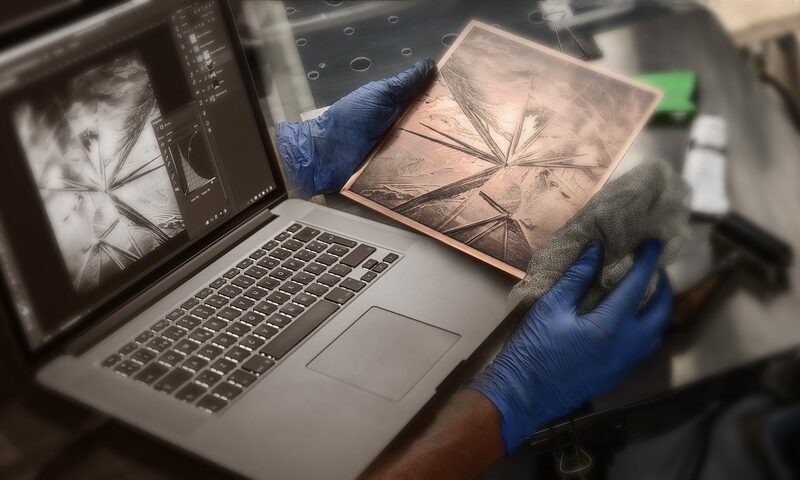 As the repeatability from several taken pictures by the same device can sometimes be in doubt up to some accuracy level, these testing procedures are far to be perfect. Following with the above mentioned methods, the use of a pulse input signal is the most accurate procedure in order to analyze the system response and is the so described as the method that implies the response in terms of Point Spread Function (PSF) (1.-BOREMAN). Being the PSF defined as the system response to a perfect input signal or point signal, this would be the best method except by its physical difficult to be achieved. With exception of some cases in astronomical devices, an intense and infinitesimally small signal is not easy available. Figure 3 – Upper section shows a digitally obtained image of a sinusoidal test target in the central two rows of patterns; up and down of them, there are a series of smooth density patterns for exposition control purposes. The graph in the lower section is a gray value plot taken from the pixels row indicated by the red arrow; the plot shows the sinusoidal shape with approximately the same modulation. In order to counteract the difficult expressed in the above paragraph, the edge response method was described (1.-BOREMAN). 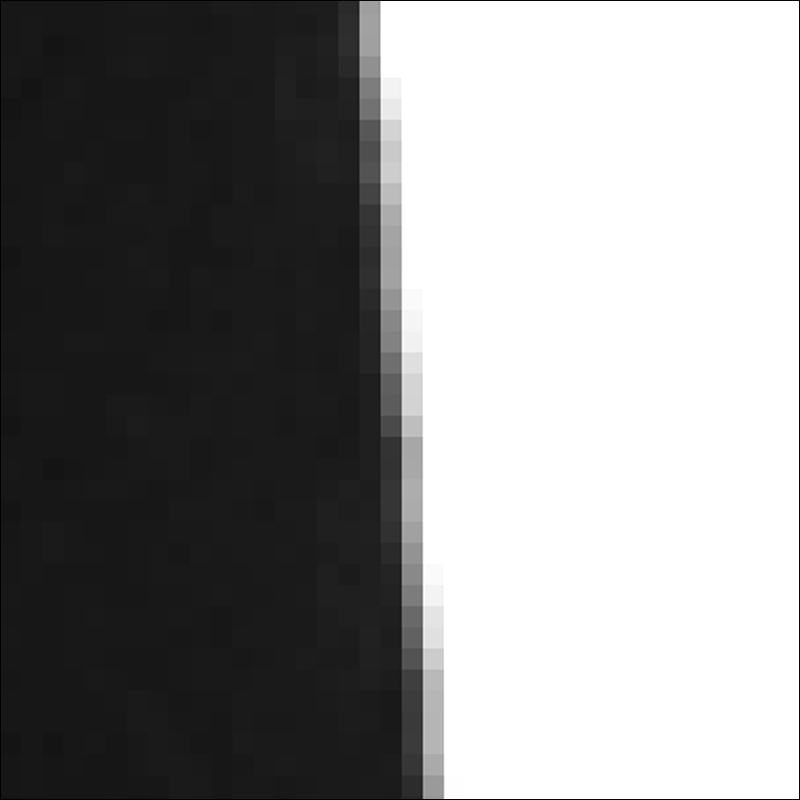 Considering the edge formed between a black area over a white surrounding as the line that defines the transition from black to white, this line can be taken into account as a succession of points each one of them is a perfect input signal. The frequency content is virtually infinite ensuring to be an input signal far above any device limiting frequency or Nyquist frequency. Sending to the system a signal beyond this Nyquist frequency provides too an easy way to put into evidence any false response as a consequence of aliasing. In addition, a perfect enough edge is relatively easy to achieve by non specialized graphical methods as photographic quality inkjet printers. Finally, the Random Pattern method (2.-DANIELS) consists in the capture of an image of a randomly distributed noise test. When appropriately prepared, this test constitutes too in virtually infinite frequency contents. The difficult consist in the method used to prepare the test and the necessary changes related with physical size and working distance properties. The relationships between the grid of points forming the test image and the camera photo sites grid are well described but not exempt of practical limitations. The edge response method to be applied to obtain a measurement of the system MTF from photographic devices must take into account the discrete character of the device sensor. Provided these non continuous properties, the sensor is not spatially invariant and this implies a conditioned relationship between the relative positions of the test edge and the matrix of the sensor photo sites. In order to avoid the coincidence between the test image on the sensor and one of its rows or columns of photo sites, the test target must be positioned slightly slanted respect the camera photo sites grid. This angle is not critical and its enough if ensures that the test image projection on the sensor grid will affect geometrically in a different way each successive row or column and hence, the method receives the name of Slanted Edge Method (7.-JACOBSON). Practical angles are used from 5º up to 10º; Figure 4 illustrates the described appropriate relative positions. 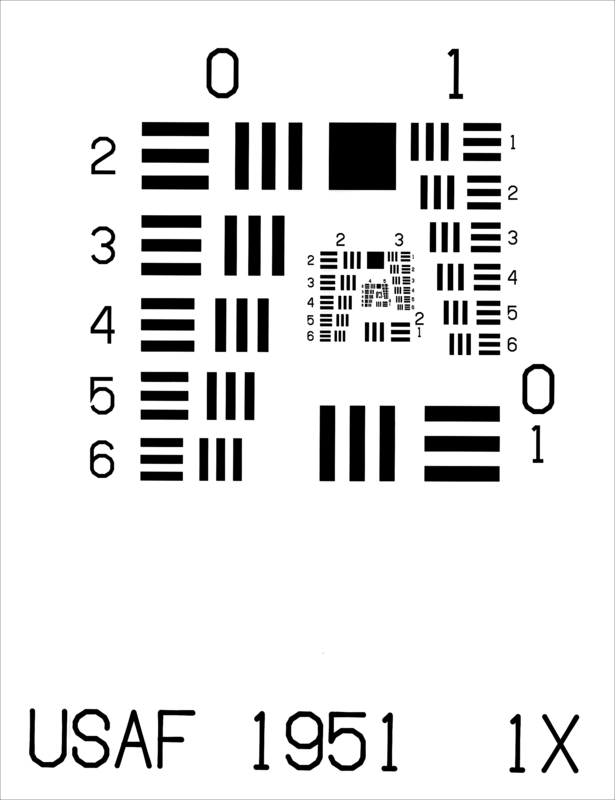 Figure 4 – Relative positions of the test target image (in gray) over the photo sites grid. After taking data from the resulting image pixels, several rows or columns must be averaged to calculate the system average MTF (7.-JACOBSON). Even though the properties of the camera lens are almost rotationally symmetrical, the way the sensor collects information that will configure de final image file data can be quite different for rows than for columns. The measure is then taken twice, from rows (horizontal measure over a vertical edge) and from columns (vertical measure over a horizontal edge). These two measures can be considered apart or averaged in turn to define the final average system MTF. The test target for the MTF measurement by the slanted edge method can be prepared by means of graphical procedures. The edge can be designed with vectorial software filling a rectangle with black ink over a white background. 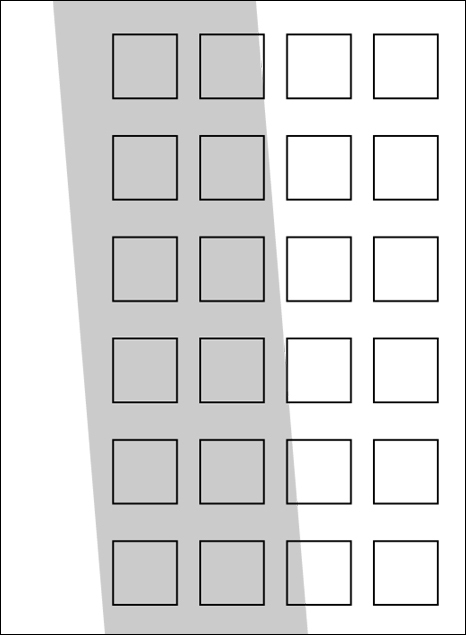 The black rectangle must not be slanted in order to avoid jagged border and the printer adjusted to its maximum resolution using only black ink; even though the use of several ink cartridges allows for a better printing resolution, the device can provide a soft edge in an attempt to print the transition from black to white. The target must be slanted hence, at taking set up. The Figure 5 shows a model of test target for the determination of the system MTF by the slanted edge method. The scheme allows for the measurement of the MTF both in horizontal and vertical directions from the same image; this procedure ensures the minimum variations introduced for repeated takings under virtually the same conditions. The area filled with characters is suitable to position the focus aid or autofocus mark and the right angle segments in the upper right area can be used to determine the actual working magnification. Figure 5 – Suitable test target for the measure of the MTF from cameras and scanners. The “L” allows for the measure on rows and columns from the same picture. 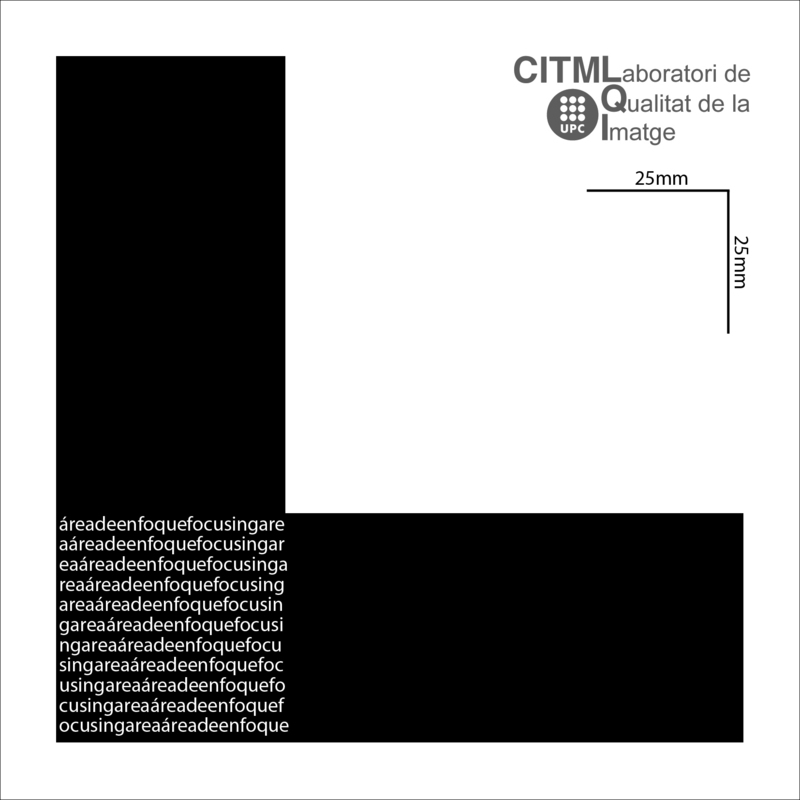 The text area helps in the appropriate focusing and the two segments at right angle are intended for the actual working magnification calculation. The test target must be imprinted on a preferably matt surface that facilitates the freedom for illumination in the experimental set up. Mounting over matte of rigid cardboard or similar material ensures its dimensional stability. Although the size of the edge itself is always the same, the size of the whole test must be suitable to cover in the image rows or columns enough to calculate a representative averaged system MTF, depending on the working magnification. The experimental set up for the determination of the system MTF by the slanted edge method will be adapted to the type of conditions of use for which the measurements are done. 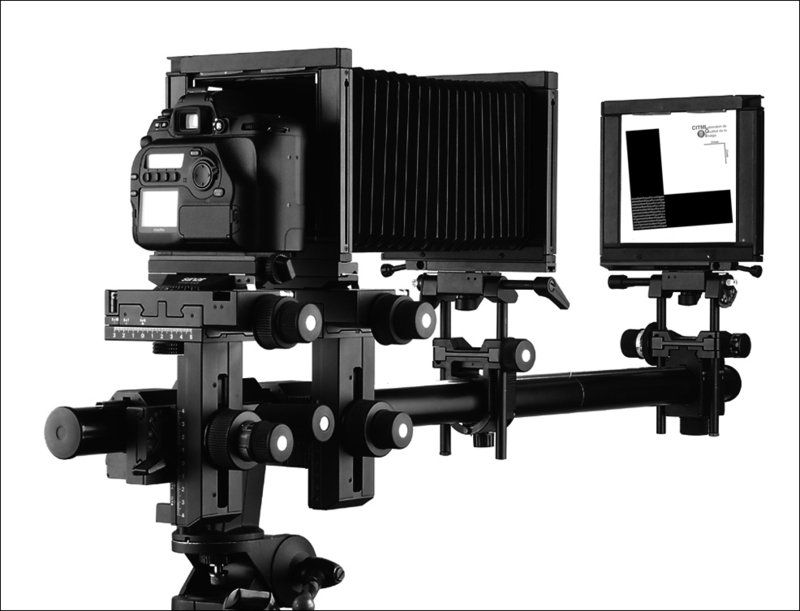 In general, the test target images must be taken in the same conditions of use for those the measurement is intended; in this way, taking distance, lens, aperture, exposure time, lighting and all kind of camera settings, must be taken into account. If the goal of the measurements is the absolute performance values, the comparison between different devices or different settings for the same device, laboratory conditions are necessary. In such a situation, the uniform illumination over the test target, the parallelism between the test plane and those of the lens and the sensor, the working magnification, the focusing system repeatability and the avoiding of sources of image shaking, are critical. To facilitate the correct relative positions between the test, the lens and the sensor, an easy and operative system is the use of an optical bench. The bench provided for the view camera systems are especially adequate because of its possibility to centre or misalign as needed the position of the test relative to the image field, as is shown in the Figure 6. For longer distances and a unique test target over the image field, the parallelism becomes not so critical provided that the area used to focus on is reasonably at the same distance that the edge itself. Figure 6 – Optical bench supporting the camera under testing at left and the test target at right. The system provides an easy and reliable method for adjusting the relative positions of test target, lens and sensor. Except for those cases where the lighting source must be a specified one, professional flash strobes are a perfect test lighting system. The professional level flash strobes provides a power light with minimum consumption, avoids heat, allows for chromatic stability over time and a lightning duration as short as 1/500s that ensures a reasonably image immobilization during the exposure time. Provided the short strobe lightning duration, the exposure time adjusted on the camera is not the responsible of the effective exposure on the sensor but the strobe energy and duration time, it is necessary to be provided with neutral density filters to control the exposure when the minimum adjustable power output exceeds the needed amount or when it must be used a given lens aperture setting. Some standards have been described attempting to unify the methodology to determine the system MTF of photographic devices. ISO/TC42N 4230 (5.-ISO) establish the conditions to be followed to determine de Spatial Frequency Response (SFR) of a photographic camera. As the recommendations are prone to unify the criteria used in those measurements by the industry, they are not always close to the most usual conditions in professional photography. Even taking into account that professional photography uses a lot of different lighting sources in its work, the most widely used in controlled situations is the professional flash strobe being also the only one that can be merged with sunlight without severe color temperature deviations. A derived case is the measurement of the system MTF from scanners, both of transmission and reflection scanning systems. For reflective devices, the test target used can be the same as above described for cameras. The test must be placed in the same way that the originals will do and any measurement must be related with the list of scanner settings used, especially those referred to the scanning resolution, bit depth, edge enhancing algorithms and descreen algorithms for halftone printed originals. The test target for transmission scanners can be, for instance, a piece of thin plastic or metal completely opaque and accurately cut. This piece must be of suitable dimensions to be placed in the same manner than the film to be scanned. A complete scanner system MTF measurement procedure and results are described in the Graduate in Photography Final Main Project “Medida de la Calidad de la Imagen en un Escáner Plano. Determinación de la MTF” (10.-ROMERO). The image of a point in a linear and stationary imaging system is the point spread function (PSF) (7.-JACOBSON) or impulse response. It is a function of two orthogonal variables (x,y), usually taken in the same directions as the image plane variables. and assuming a receiver continuously sampled and a capability to measure the image irradiance distribution g(x,y) to the necessary spatial precision, the impulse response h(x,y) is the so called PSF (1-BOREMAN). For isotropic systems, the PSF will be rotationally symmetrical. The shape of the PSF, in particular it’s extend in the x and y directions, determines the device image quality performance. The PSF can be Fourier transformed in two dimensions and taking each magnitude yields each respective MTF (1-BOREMAN). Figure 7 – The LSF is the two-dimensional convolution of the line source with the system PSF. Figure 8 – The ESF the two-dimensional convolution of the edge source or step function with the system PSF. Since the reverse relationship must apply, the first derivative of the ESF gives the LSF; as a corollary of the above explained, the modulus of the LSF Fourier transform, gives the MTF (1-BOREMAN). Following the above described theory, the sequence of calculus begins with the extraction of the pixel gray values of a row or a column from the captured test target image and plotted as the Edge Spread Function (ESF). The series of values is then differentiated obtaining the values of the LSF. The Fourier transform is applied to the LSF values and the modulus is normalized to the unity. The ESF might be as close as a perfectly step function for the best system performance. Any departure from the perfect edge indicates a system PSF response having lost some of the frequency contents of the input signal; in terms of frequency, the system acts as a low pass filter and the amount of frequency passed by the system characterizes its performance. The Figure 9 compares the response of a theoretically perfect system (above) with the results obtained from an actual photographic camera (bottom). Figure 9 – Upper section shows the sequence of calculus from the Edge Spread Function to the Modulation Transfer Function for a theoretically perfect system. Lower section shows the same procedure for an actual digital still camera. Note the actual ESF departure from the ideal edge that implies the falling down of the MTF curve showing as the system acts as a low pass filter blocking out some of the high frequency components. As the relative position of the test target image and the photo sites grid results in a sampling periodicity (Figure 10), several rows or columns must to be measured and averaged to ensure a representative response measure. Because of the slanted position of the edge over the image pixel grid, this average cannot be obtained by simply averaging pixel columns. Individual row or columns measurements must be done in order to localize the edge position for each row or column; the average LSF can be then obtained after aligning the maximum values of each row or column LSF. After the average LSF is calculated, the normalized modulus of its Fourier Transform provides the system MTF. Frequency can be plotted as relative unit cycles per pixel (cycles/pixel) or as an absolute value from the camera number of pixels and sensor size; in the last case, the most usual unit employed is the line pair per millimeter (lp/mm). In the method that we have described above, the frequency contents are analyzed up to the device limiting frequency or Nyquist frequency; the Nyquist frequency equals the half of the device sampling frequency. Other methods of calculations are described combining data from several rows or columns in a suitable interlaced modus that allows the response up to twice the Nyquist frequency (7.-JACOBSON). This is especially useful to detect aliasing phenomena. 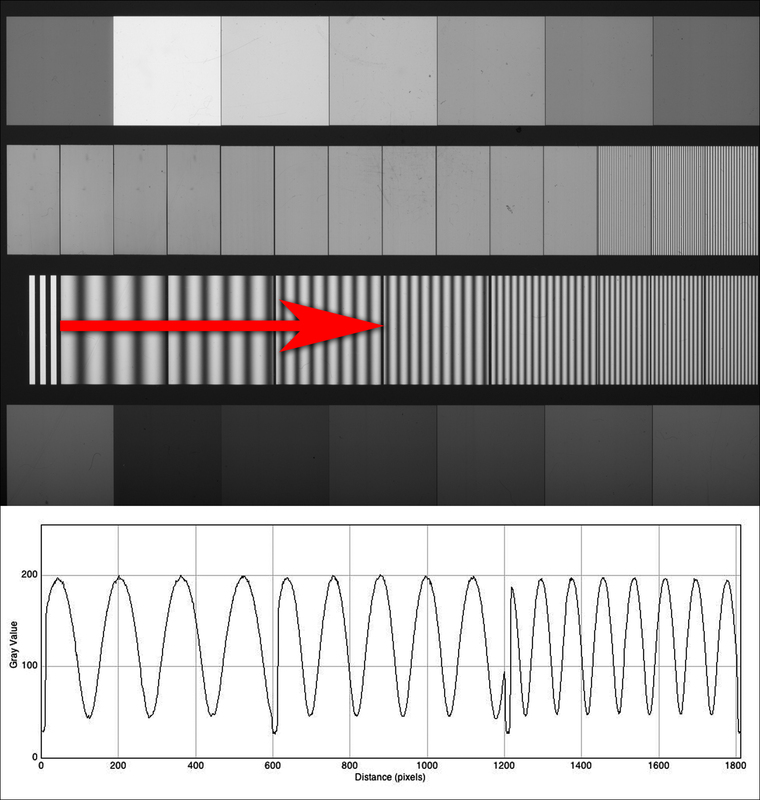 Figure 10 – Magnified section of an actual edge image showing the periodicity pattern caused by the slanted position of the test target image over the sampling grid of camera photo sites. All MTF calculations in the examples of this work have been done using a plug in specially developed to be used into ImageJ software. ImageJ is free access software intended to process and analyze images. The software basis is a multiplatform compatibility that grows from plug in contribution developed from the users needs. The plug in SE_MTF (9.-MITJÀ) performs the calculations to extract the MTF from an edge image; the edge can occupy the whole image or the user can select a Region of Interest (ROI) to be analyzed. The method used to calculate the MTF from a slanted edge have been described in the precedent section. As usual in ImageJ, the file SE_MTF.zip must be copied to the plug in folder or subfolder; after decompress the file and restart ImageJ, the SE_MTF label will appears in the Plugins menu. On activation, it will open the SE_MTF frame with the button Generate MTF, as is shown in the Figure 11. Error, “File must be in TIFF or JPEG format: Process cancelled” for images other than TIFF or JPEG files. Warning, “All image selected” if there is no ROI selected in the active image window. 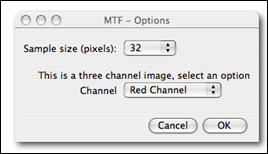 The user can press the OK button and the plug in will use all image rows to calculate the MTF. If a ROI is selected, the message will not appear and the MTF is calculated from the pixels of selected rows. MTF Options: This last frame takes different aspect related with the image bit depth. For images in grayscale mode, the MTF Options frame shows the message “This is a grayscale image, no options available” and the user can select a sample size in pixels (32, 64, 128, 256 or 512); the figures are the number of pixels at the edge used to make the calculations and half the selected quantity is taken on both sides of the edge, Figure 12. The different pixels number options can be used to take enough representative data both in images with low or high spatial resolutions. Obviously, the figure selected must be smaller than the image width or ROI selected; nevertheless, the plug in launch an error message if the figure selected is bigger than the ROI or image width. If there is an RGB image opened, the frame MTF Options offers to choose between select the R, G or B channel or to perform the average measure, Figure 13; if the “Channels average” option is selected, the average is done as plain or weighted average depending on options selected in ImageJ Conversion Options (see ImageJ documentation). The R, G and B channels MTF can be calculated successively, selecting the appropriate option each time. For images that ImageJ opens as an stack (16bit, etc. ), the plug in offers the frame MTF Options as in the grayscale images and the calculations are done on the active slice; the user can make successive channel calculations or convert to an RGB image if channels average is preferred. 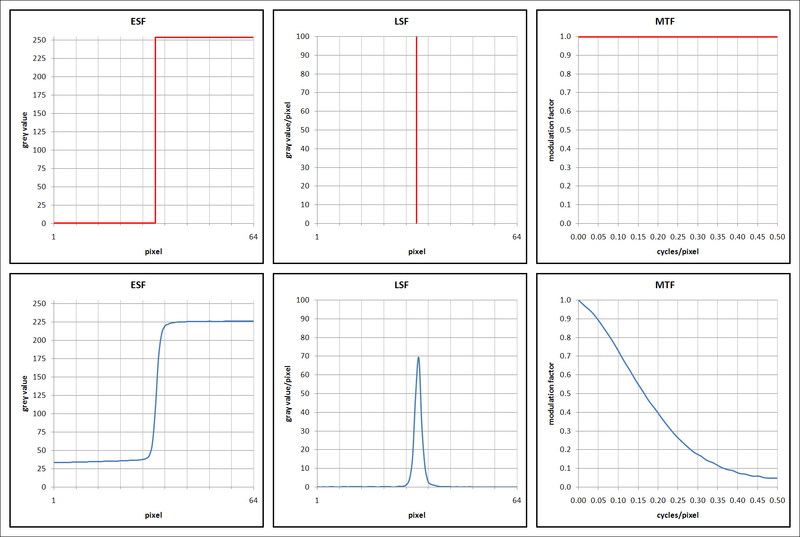 After the button OK is pressed, the plugin run the calculations and shows as a result four plots labelled with the SPP_, ESF_, LSF_ and MTF_ prefixes followed by the file name. ESF, LSF and MTF plots are calculated and traced as described in the MTF bibliography. SPP plot (short for Sampling Periodicity Plot) is a plot showing the result to apply the Fourier Transform Function to the series of the maximum values of the LSF of the number of rows or columns used in the MTF calculations; the plot is a valuable indicator of the clear or not periodicity sampling performed by the system because of the slanted position of the edge related with the sensor grid. In general, cheap cameras or scanners show a confused SPP with no clearly isolated peaks; conversely, a well calculated file from a professional camera or high end scanner shows a clearly isolated peak related with the number of pixel rows that occupies the period of sampling. The four plots generated by the plug in takes the size and proportions from the previously selected options by the user in the Edit>Options>Profile plot options menu in ImageJ. The represented units are indicated in each plot and the user can take advantage of the three buttons below the plots in order to list, save or copy the plot values and export it as is usual in ImageJ. As usual too, the plots can be saved as images for further use. • Read on the pixel gray value of each row in the image or selection; saving as series of ESF. • Differentiation of the gray values lists corresponding to each row of values; saving as series of LSF. • Determining the maximum value of each LSF. • Aligning the LSF centering the detected maximum values; this allows for the actual edge position on each row of values. • Averaging the centered LSF; saving the average LSF. • Calculating the Fast Fourier Transform (FFT) of the average LSF. • Normalizing the FFT modulus and saving the values. The system MTF curve can be divided in at least three differentiate regions: Low, medium and high frequency at left, centre and right respectively. For an actual camera or scanner, the curve achieves the maximum modulation factor of unity at the “0” frequency falling down as frequency values are increased. For curves with similar shape, the area encompassed by the MTF curve is proportional at the device performance. Nevertheless, different image processing adjusted on the camera or the file aperture software can vary the shape making difficult this kind of comparison. The curve must reach near the “0” modulation when the input frequency matches the device limiting frequency or Nyquist frequency. While the region of low frequency is very similar for any kind and quality of devices (Figure 14), the central and right portions corresponding to respectively medium and high frequencies are the really important to analyze. Figure 14 – In the upper row, MTF of indicated devices; at bottom, the corresponding ESF curves. In the ESF curves corresponding to the cellular phone and web cam cameras can be easily observed the presence of algorithms of edges enhancing. The ESF of the Nikon camera is more soft and rounded in shape, claiming for the absence of processing of the raw file. The graphs of the Figure 14 show that comparing the MTF of several devices, results in a risk of misinterpretation. 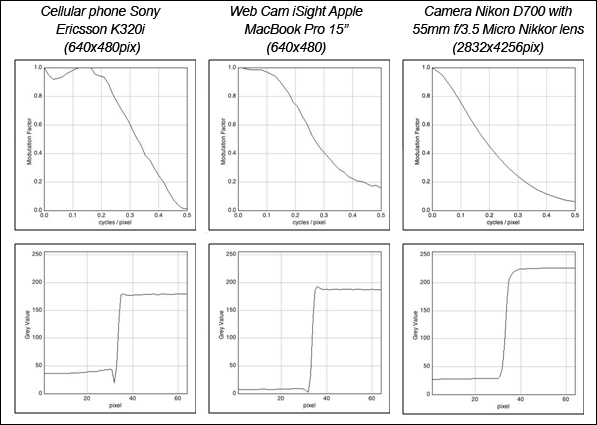 In fact and observing only the MTF plots, the best apparent result is for the web cam from Apple, while the professional Nikon camera appears to have a discrete performance. Analysing the ESF graphs can easily be observed that the plots show aggressive edge enhancing processing with clearly visible artefacts near the edge created by the artificially added Mach bands in an attempt to raise the original image quality. The Nikon camera ESF plot shows the absence of image processing that derives in an apparently poor result; otherwise, this result can be enhanced by digital image processing in a way that avoid the apparition of edge artefacts (Figure 15) and then, the whole image quality is better at all. Image quality expectancy is a bit more complex than to realize the shape of an MTF curve. 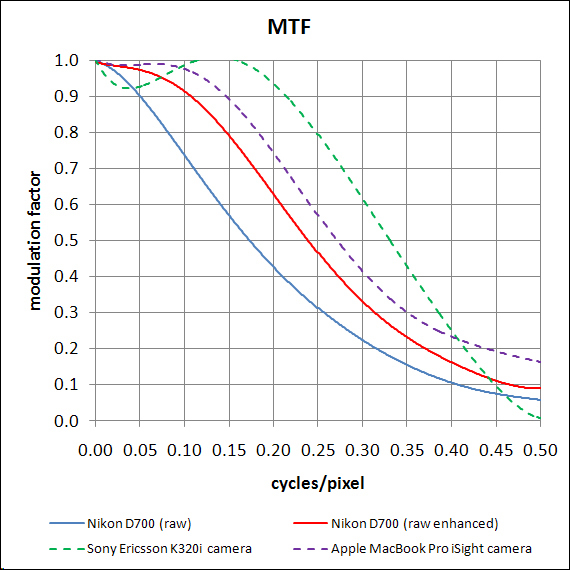 Coming back to the curves shown in the Figures 14 and 15, the cellular phone MTF don’t shows modulation factor at Nyquist frequency level, while the MTF of the iSight camera rises up to a modulation factor of 0.18 for the same region; finally, the MTF of the Nikon camera shows a discrete 0.05 value. High values of the modulation factor at the device cut off frequency indicates possible aliasing; the higher frequency components of the input signal are replicated as lower frequency false responses by the system. This corruption is not only affecting the Nyquist frequency region but probably at least the last third of the device resolution available (3-DIRK); this behaviour compromises the retention of the nominal image quality performance. Figure 15 – Comparative MTF of the three cameras shown in the Figure 14 plus a red plot indicating the best result obtained from the professional camera without edge enhancing artifacts. As previously commented, the cellular phone and computer cameras are only apparently better. • The lens of the Sony Ericsson camera is of so poor condition that does not enter high frequency components to the system, hence there is not any possibility of false response or aliasing. The rising of the MTF curve at medium and low frequency regions is at expense of the artefacts introduced by the edges enhancing processing, as is shown by the ESF plots. • The lens of the iSight Apple camera is of better condition than the cellular phone one, but the system don’t incorporates an efficient anti-aliasing filter to counteract the higher frequency components of the input signal. The nominal curve is artificially enhanced by internal processing and shows the same artifacts as the cellular phone camera as can be seen in the ESF plots. • Even though at the aperture set on the lens used in the Nikon camera it sends to the system more than five times the frequency that can be resolved by the sensor, the system incorporates an efficient anti-aliasing filter that reduces the false response to a moderate level. On the other hand, the initially achieved performance level can be enhanced by digital image processing as is shown in the red plot of the Figure 15; this post-production operations allows to avoid exaggerate enhancements carrying image artifacts, as can be seen in the Figure 16 plots. Figure 16 – At left: Nikon D700 superimposed ESF before and after image edges enhancement; observe the artificial dark zone added before the edge slope and the less rounded edge achieved after enhancement. At right: The resulting MTF before and after the edge enhancement. The enhancement shown in the Figure 16 is near the best result achievable with the classic Unsharp Mask Filter at the appropriate settings; those settings have been controlled until before the apparition of artefacts in form of white artificial line on the high region of the edge slope. The dark zone added by the algorithm before the edge slope, will not be seen as an artefact because of the difficult to be perceived by the observer such a little gray value variation in a low level region. Additionally, there must be taken into account that while the cellular phone and the computer cameras provide small 640x480pixel images, the Nikon one allows for a nominal image of 2832x4256pixel. Using a minimum of 150ppi of output printing device resolution, the two simplest cameras will provide a hard copy size of 4.2″ or 10.8cm wide; the Nikon camera rises up to 28.4″ or 72cm for the same output resolution. Even considering only the on screen observation, the screen resolution of an Apple MacBook Pro of 15″ laptop is of 110ppi. Under this output device, the cameras of the cellular phone and web cam raise the image size to 5.8″ in wide or 14.7cm, roughly a little small than the half of the laptop screen. The image provided by the Nikon camera is of 36.7″ wide or 98.3cm exceeding the screen size and allowing for image detail exploration. Image quality performance is then a question to be analysed not only in terms of MTF curve but with complementary analysis as the shape of the ESF and the intended use or application of the device under test. Previous testing of the lens used by the system may be a valuable aid in determining the possibility to have problems with false responses caused by aliasing; a poor condition lens or limitations by diffraction at certain aperture values excludes this possibility. Any image processing, in camera or as a post-production process, can significantly vary the results of the MTF measurement. In this way is especially important to consider the different options offered by the raw files aperture software; default settings are usually applying edges enhancement and noise reduction algorithms that can corrupt the original edge shape. In general, alterations of the MTF shape departing from a continuous falling down in contrast, especially in the low and medium frequency regions, can be suspicious of some type of artificial enhancement that must be carefully verified looking for image artefacts. 1.- BOREMAN, Glenn D., Modulation Transfer Function in Optical and Electro-Optical Systems. SPIE Press. 2001. 2.- DANIELS, A., BOREMAN, G. D., DUCHARME, A. D. and SAPIR, E., Random Transparency Target for Modulation Transfer Function Measurement in the Visible and Infrared Regions, Opt. Eng. 34, 860-868, 1995. 3.- DIRK, MD and Stork, DG (2008) Joint digital-optical design of superresolution multiframe imaging systems. Appl. Opt. Apr 1;47(10):B11-20. 4.- GLYN, Earl F. USAF 1951 and Microcopy Resolution Test Charts. efg’s, Tech. Note. [On line]. URL http://www.efg2.com/Lab/ImageProcessing/TestTargets/ [last visit 18/08/2010]. 5.- ISO / TC42N 4230 (1997) Electronic Still Picture Imaging. Spatial Frequency Response (SFR) Measurements. International Organisation for Standarisation. 6.- JACOBSON RE, TRIANTAPHILLIDOU S. Metric Approaches to Image Quality. Paper accepted for presentation at CIS’2000 (April 10-12) University of Derby, UK. 7.- JACOBSON, R. E., RAY, S. F., ATTRIDGE, G. G. y AXFORD, N. R. (2000) The Manual of Photography. Focal Press. 9ªEd. London. 8.- LAMBERTS, Robert L. Use of Sinusoidal Test Patterns for MTF Evaluation. [On line]. URL http://www.sinepatterns.com/MTF/EngNotes.htm [last visit 14/11/2002]. 9.- MITJÀ, Carles and REVUELTA, Raquel. SE_MTF plug in. On line: http://rsb.info.nih.gov/ij/plugins/se-mtf/index.html Last review: August, 16th, 2010. 10.- ROMERO DURÁN, Rosi (2005) Medida de la Calidad de la Imagen en un Escáner Plano. Determinación de la MTF. Final Main Project. 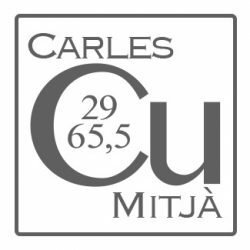 Project Director: Carles Mitjà. Centre de la Imatge i la Tecnologia Multimèdia, Universitat Politècnica de Catalunya. 11.- WILLIAMS, John B. (1990) Image Clarity, High-Resolution Photography. Focal Press. Boston, London.